The first time Harold stepped inside Avon Barber Shop (ABS), he was just hoping for a decent cut and shave. But what he got was far more fulfilling. A burly, bearded man invited Harold to sit down in his swivel chair. Collins proceeded to trim and shave his client. Then at 10 a.m., Collins’s watch alarm beeped. Harold sat, stunned but intrigued, as he watched Collins, owner of ABS, join hands with his colleagues, forming a prayer circle. Harold listened intently, his mouth agape because never before had he witnessed such an open expression of faith in a workplace. A minute later, the men said in unison, “Amen” before returning to their stations. “What’s that all about?” Harold asked. Harold, an older gentleman with few friends and family, was impressed by what he saw that day, but it wasn’t until months later that he fully appreciated the mission ABS’s employees have to encourage and lift up their clients in prayer. 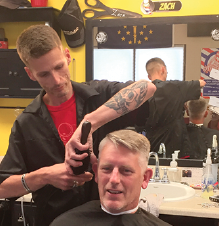 After receiving a cancer diagnosis, the first people he told were the men at Avon Barber Shop, located in Avon, Indiana. As cancer and chemo have ravaged his body, his spirit continues to thrive, thanks to the support he receives from the barbers at ABS. When Collins first opened ABS, he had a clear vision for what he didn’t want it to be. Most of the barbershops he had worked in had marijuana smoke hanging in the air and profanity-riddled music blaring in the background. In addition, the majority of the clientele spewed vulgarities. For several years, he worked at various barbershops, then pursued a totally different career path for a time before realizing that barbershop work truly was his calling. But an additional calling soon accompanied his passion. After experiencing a painful breakup and suffering a series of personal setbacks that left him feeling deceived and disillusioned, Collins turned to God, in search of truth and authenticity. At age 28, he gave his life to Christ. Soon after he opened Avon Barber Shop with a firm mission in mind—to bring the Lord to work with him every day and hopefully introduce his customers to Christ. Collins’ colleagues, however, took some time to warm up to the idea of demonstrating their faith so openly. For example, Short, a non-practicing Christian when he first crossed paths with Collins, resisted the idea of praying out loud as a group. “I didn’t want to risk being judged or offending someone,” says Short. His colleagues, however, kept ministering to him, day in and day out. “They told me, ‘You make 226 choices a day and there are 226 consequences to each of those choices.’ That really stuck with me,” says Short, who ultimately let God back into his heart and, as a result, experienced extreme transformation in his life. “My health, my relationships, and my attitude improved when I handed my life over to Christ,” says Short. Now ministering to people is part of Short’s everyday job as he and his colleagues cut, care, shave, and share. It’s what Short jokingly refers to as non-licensed “chair-a-py” where customers come not just for shampoos and cuts but also for moral support. Prior to coming to ABS, Joey, one of Collins’s clients, labeled himself as agnostic—someone who was “on the fence” about Christianity. Ever since he was a little boy, Joey didn’t know if he trusted the Bible, nor did he like the hypocritical nature of some of the Christians he had met. As Collins cut Joey’s hair, he spoke about God, but Joey wasn’t receptive to the message. Then Joey got married, and he and his wife decided to try and have a baby. When they had trouble conceiving, Joey spoke to Collins about the stress of infertility, and how they had spent tens of thousands of dollars on in vitro fertilization, but to no avail. “Well, it can’t hurt to ask, right?” Collins said, silencing his watch alarm that had just sounded. “Care to join us in the prayer circle?” Collins asked. “Dear Lord Jesus, if it’s your will, please bless Joey and his wife with a child,” Collins prayed. One month later Joey’s wife became pregnant, prompting Joey’s faith to shift as he witnessed a glimpse of God’s almighty power. Sadly, his wife lost the baby a few weeks later. When Joey returned to ABS, he asked the men to pray for comfort. “Joey had accepted that God is real, and he welcomed God’s open arms as he grieved the loss of his baby,” says Collins. Tragically, just a few weeks later, Joey fell asleep behind the wheel while driving and was killed. Though the accident was heartbreaking, Collins was relieved that Joey had accepted Christ as his Lord and Savior prior to his passing. In a way, Joey made it to Heaven by way of a haircut. 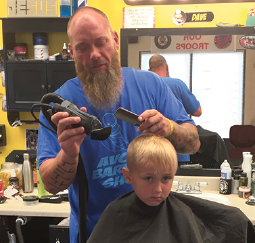 The barbers have also ministered to a woman named Kelsey who brought her 4-year-old son, Jackson, in for haircuts. Not long after they started coming, Jackson was diagnosed with Kawasaki disease, in which blood vessels in the body become inflamed. His health went downhill fast, and Kelsey feared her son wouldn’t survive. “We started praying hard for that little boy,” says Collins. Kelsey, panic-stricken and angry with the Lord, relocated to a different state to seek treatment for her son. A year later, she walked into ABS with astounding news. “Doctors can no longer find a trace of the disease in Jackson’s blood!” she reported, wrapping her arms around her tattooed team of devoted prayer warriors. A son was cured, a mother’s faith restored. Collins insists that encouraging others in the workplace is nothing short of a win-win situation. Christy Heitger-Ewing is a freelance writer and columnist living in Avon, Indiana, with her husband and two sons.